Xclor Powder For Suspension (PFS): After reconstitution, each 5 ml reconstituted suspension contains Cefaclor 125 mg as Cefaclor Monohydrate USP. Xclor (Cefaclor) is contraindicated in patients with known allergy to the Cephalosporin group of antibiotics. Adults: The usual adult dosage is 250 mg every 8 hours. For more severe infections (such as Pneumonia) or those caused by less susceptible organisms, doses may be doubled. Gastrointestinal symptoms occur in about 2.5 % of patients including diarrhoea (1 in 70). Symptoms of pseudomembranous colitis may appear either during or after antibiotic treatment. Nausea and vomiting have been reported rarely. As with some penicillin and some other Cephalosporins, transient hepatitis and cholestatic jaundice have been reported rarely. Pregnancy: Animal studies have shown no evidence of impaired fertility or teratogenicity. However, since there are no adequate or well-controlled studies in pregnant women, caution should be exercised when prescribing for the pregnant women. Lactation: Small amount of Cefaclor have been detected in breast milk following administration of single 500 mg dose, caution should be exercised when Cefaclor is administered to a nursing woman. There have been reports of increased anticoagulant effect when Xclor (Cefaclor) and oral anticoagulants were administered concomitantly. As with other beta-lactam antibiotics, the renal excretion of Cefaclor is inhibited by Probenecid. 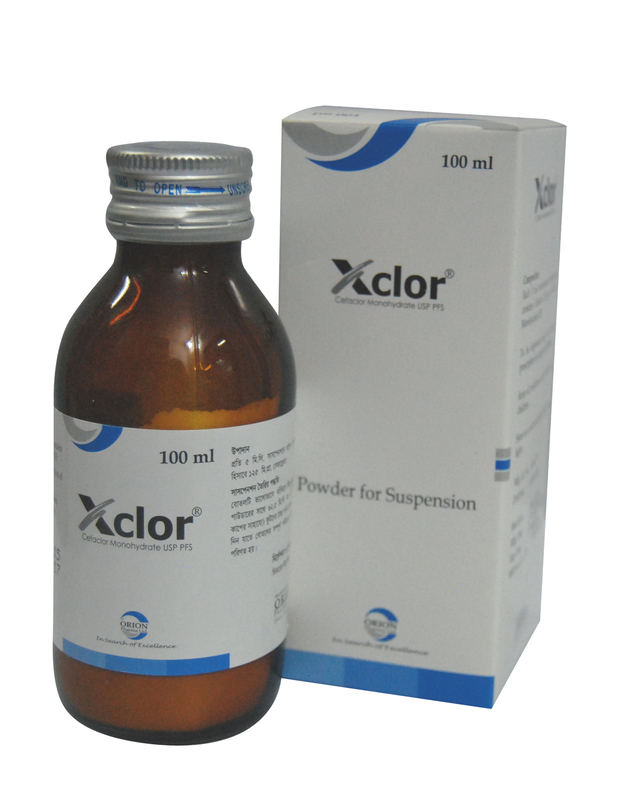 Xclor suspension: Bottle containing dry powder for 100 ml suspension after reconstitution and a 10 ml measuring cup.